I think we can officially claim that Brooklyn is THE land of freelancers. In fact, according to Brooklyn Chamber of Commerce, out of 2,6 million Brooklyn residents 73,500 are self-employed. And as a Bushwick resident you are likely to be one of them. While employers train their employees, as a freelancer you are in charge of advancement of your career, which includes networking and education. You should therefore definitely mark April 20 in your calendar (or better yet register) for Brooklyn Freelancers Summit presented by the Brooklyn Chamber of Commerce, in partnership with LiquidTalent, is coming up! Brooklyn Freelancers Summit is a summit dedicated to advancing Brooklyn's independent workforce, and this half-day summit will explore issues surrounding Brooklyn’s freelance economy, bringing together the burgeoning freelancers community for a day of networking, education, and knowledge-sharing. At the summit you will learn how to structure your business, how to develop your personal brand, and expand your reach and grow your business. And most importantly, you will have a chance to create a number of valuable relationships. The structure will feature introductory remarks, two breakout sessions, lunch & networking, and a closing keynote. The speakers include Vinjay Jain (Shake Law), Matthew Brimer (General Assembly), Alex Rappaport (Flocabulary), Miguel McKelvey (WeWork), Prof. Arun Sundararajan (NYU), Borough President Eric Adams, among others. We have some more good news. Register with promo code Bushwick and receive 25% off admission ($15 instead of $20!). 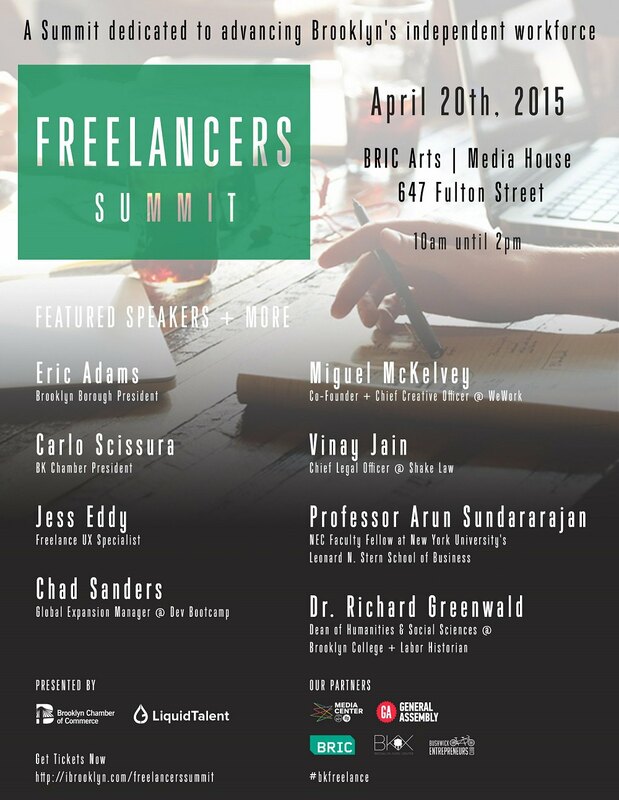 Brooklyn Freelancer's Summit, Monday, April 20, 10AM-2PM at BRIC Arts, Media House, 647 Fulton St., Brooklyn.